What is Reiki? What will I learn? Reiki is a simple, effective healing practice that enhances health and well-being by promoting overall balance. Common benefits include improved sleep, digestion, mood and focus, and reduced anxiety, pain, and depression. supports any needed medical care, softening unwanted side effects and hastening recovering. First degree training is where everyone starts, professionals and the public. You will begin practicing Reiki an hour into the first session, and leave the class able to practice on yourself, and informally with family, friends, and pets. 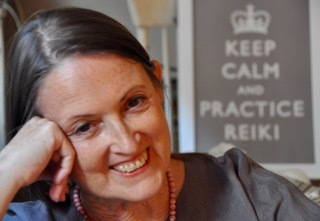 Pamela Miles, author of REIKI: A Comprehensive Guide, has practiced Reiki since 1986 and is the foremost pioneer integrating Reiki into conventional medicine, teaching in medical schools, including Harvard and Yale; organizing Reiki programs in hospitals; collaborating on research; writing peer-reviewed medical papers; and training Reiki professionals in healthcare collaboration. This is a 3-session class held Wednesday, Thursday and Friday, October 15, 16, 17. Each session starts promptly at 6PM. Please note it is necessary to attend all sessions in their entirety.